November 20, 2012 - James R. Cate, 68, appeared in federal court in Lubbock, Texas, on Tuesday before U.S. District Judge Sam R. Cummings and pleaded guilty to a superseding information charging the federal felony offense of making a threat to an aircraft, announced U.S. Attorney Sarah R. Saldaña of the Northern District of Texas. Cate faces a maximum penalty of five years in prison and a $250,000 fine. Judge Cummings ordered a presentence investigation report with a sentencing date to be set after the completion of that report. Cate, who resides near Talpa, Texas, remains on bond. According to documents filed in the case, on February 29, 2012, Cate, using a Ruger Number One 25-06 caliber single shot rifle with a Redfield scope, shot a crop duster plane. At the time Cate shot the aircraft, it was flying over a field neighboring his land near Talpa, dusting crops. Before he actually shot the aircraft, Cate fired three rounds from the rifle into the air. 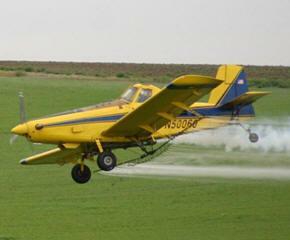 Cate admits that he threatened the aircraft to frighten the pilot away from his crops. The last round that Cate fired hit the propeller of the aircraft, penetrated the engine cowling traveling toward the rear of the plane, passed through the firewall and the spray hopper (which contained nearly 500 gallons of chemical used for the crop spraying), entered the cockpit where it fragmented into multiple pieces (at least one of which tore through the leg of the jeans the pilot was wearing), and then passed into the rear fuselage, all of which caused damage to the aircraft. The investigation is being conducted by the FBI and the Federal Aviation Administration. Deputy Criminal Chief Assistant U.S. Attorney Denise Williams is in charge of the prosecution.